Sheltered beaches on the west coast of Providenciales. Stand up paddle boarding is easy to pick up and the best way to experience the mangrove wetlands and shallows. Due to the added height over the water compared to kayaking, you’ll get a much better view of wildlife in the water. If you have polarized sunglasses, be sure to bring them as they will cut down on water reflections. Wind can have a large effect on movement, so be aware of the weather. 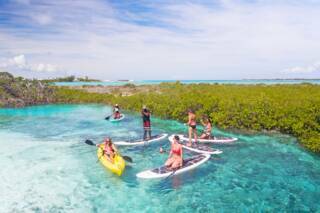 Stand up paddle boarding (also known as stand-up paddle surfing and SUP) is a relatively new watersport to the Turks and Caicos and is rapidly gaining in popularity. The theory of paddle boarding is quite simple: stand on a large surf style board and propel yourself with a long handled single bladed paddle. Paddle boarding is great way to see the sea life in the marshes and mangrove wetlands around Providenciales. Paddle boarding is easy to master and the only equipment needed is a purpose made board and a long handled paddle. It's an easy sport to get the hang of and most beginners will be cruising around after about a half hour of practice. A basic level of fitness and balance is required to paddle board, and the sport is generally suitable for anyone over about 10 or 12. As with all water sports, weather will greatly affect your paddle boarding experience. Generally, it's most pleasant to paddle board in calm, windless conditions. Kayaks tend to be better in choppy and windy conditions, and for long distance travel, so choose the right tool for the job. For paddle board wave riding, smooth, rolling waves are best. A rack of paddleboards in Leeward, Providenciales. 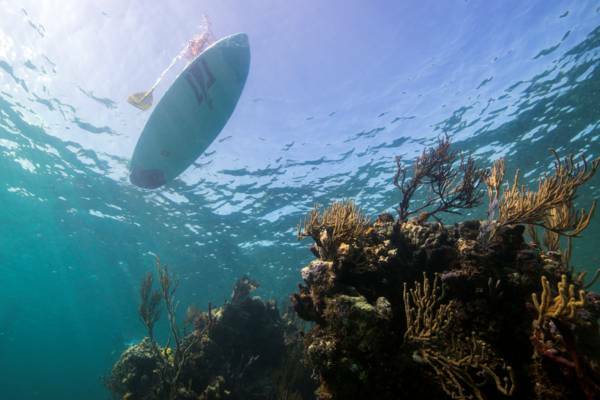 One of the main attractions of paddle boards over kayaks and other water craft is the ability to get a much better view of the surrounding sea life due to the greater height over the water. Paddle boarding is also quiet and doesn't cause much water disturbance, so animals aren't likely to be scared off. 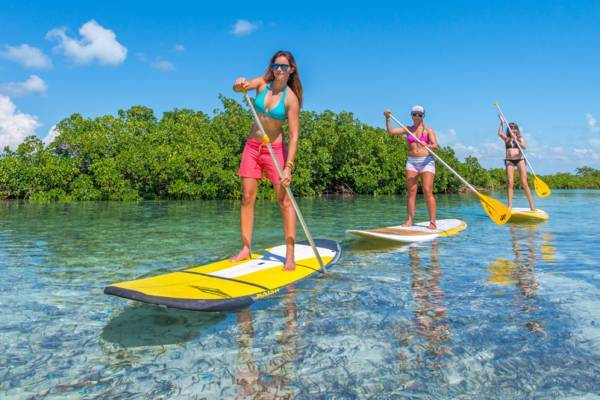 For these reasons, paddle boarding is probably the best way to experience the environment of the mangrove wetlands and shallows of the Turks and Caicos. In the sheltered waterways, it's common to see turtles, small lemon sharks, bonefish, conch and pufferfish, along with the abundant birdlife. Open water cruising spots are found all around Providenciales, with the most popular being off the north and northeast coast. It's a good idea to pay attention to wind direction, as it's much easier to paddle with the wind than against it! It makes sense to start you journey travelling upwind, and then enjoy the easier return trip. Although quite popular in some countries, paddle board wave riding hasn't really caught on in the Turks and Caicos for the same reason surfing hasn't: the conditions are generally too calm here! 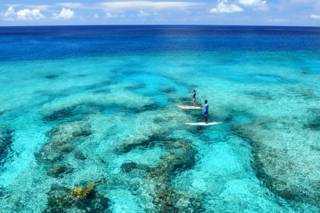 When the surf is up, the best wave riding spots are generally found off the barrier reef on the north coast of Providenciales. However, as the reef is about a mile off shore, it's not really easy or safe for someone new to the area to try to venture out. If you have an interest in wave riding, it's best to contact one of the local providers about locations, conditions, and boating to appropriate spots. Paddle boarding at Smith’s Reef. Most of the paddle boarding in the Turks and Caicos is done on Grace Bay, but this is obviously because most of the hotels and resorts are located in this district. Grace Bay is a good area for open water cruising, but doesn't have the wildlife found in the sheltered wetlands. The mangrove wetlands of the Princess Alexandra Nature Reserve to the east of Providenciales are a great location for eco tours. The sheltered areas inside the mangroves are usually calm, and wildlife is abundant. Watersport provider Big Blue Collective is located nearby and offers rentals and guided tours through the area, so this is the easiest wetland to access by paddle board. Chalk Sound National Park is another interesting place to explore. This area is a 3.5 mile long inland shallow body of water that's connected to the ocean by a small inlet. Hundreds of small scenic rocky islands are found here, along with the occasional Bonefish and Barracuda. Be aware of the direction of the wind as it can be hard to work your way back to your starting point at this location on breezy days. Frenchmans Creek and Pigeon Pond Nature Reserve on the west coast of Providenciales can be an excellent place to explore. This national park is a network mangrove trees and shallows and is an excellent location to see juvenile sharks and Brown Pelicans. Frenchman's Creek is a relativity remote area with a higher risk of crime than more populated areas. See Safety and Crime for more information. There are a large number of small cays and rocks accessible from Providenciales as well. 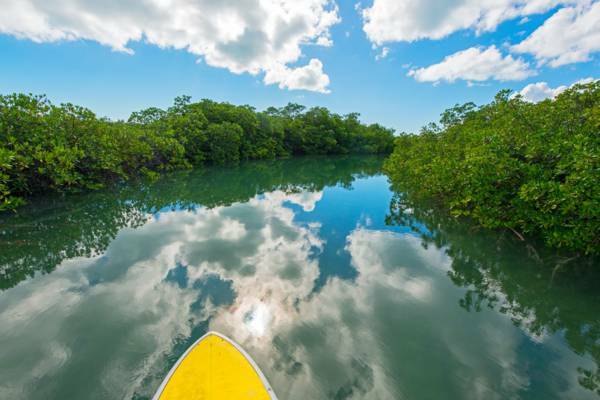 The mangrove channels of Frenchman's Creek Nature Reserve. 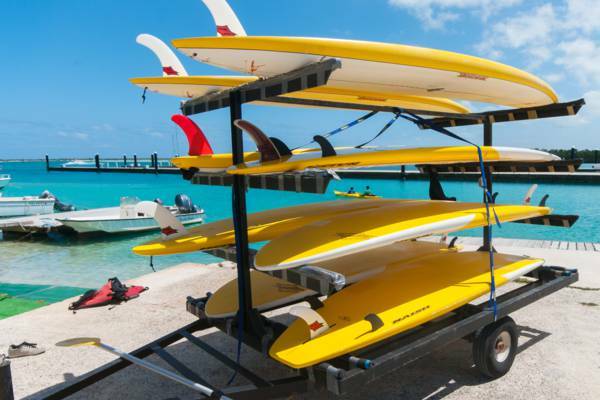 There are quite a few options for obtaining paddle boarding equipment on Providenciales. For those staying at one of the main resorts, complimentary gear is often available to guests. Several local businesses also rent equipment and provide guided eco-tours. See below for details. The local Windvibes event added stand-up paddle boarding to the competitions in 2012. Competitors for the stand-up paddle boarding race have to navigate around a set of buoys. Discover the wetlands of Providenciales, the Caicos Cays and North Caicos on one of our stand up paddle boards. We have guided tours with durations from 90 minutes to 4 hours, custom adventures, and rentals. Rising Tide Tours features guided kayak and paddle board eco adventures to the mangrove wetlands and estuaries near Providenciales. Experience breath-taking crystal-clear water and see fish, birds, sharks, iguanas, turtles, conch, starfish, and much more. Last reviewed by an editor on 25 March 2019.